The Zhao clan has held powerful and influential positions for generations, and now Zhao Dun is Prime Minister and his son Zhao Shuo is a general in the army who is married to the King’s sister. Tu’an Gu (Wang Xueqi) their mortal enemy is determined to overthrow them, he plans a military coup leading to the slaughter of the entire clan, or so he thinks. A lone Zhao baby miraculously survives the savagery and with the help of the family doctor, Cheng Ying (Ge You), is smuggled out and taken to live with him, his wife (Hai Qing) and their own new born son. After more bloodshed, Cheng Ying raises the child as his own and bides his times to wreak revenge on the evil tyrant. The work of one of China’s most influential directors Chen Kaige (Farewell My Concubine, The Promise), Sacrifice (Zhao shi gu er) is an epic tale of paternal love and retribution starring award-winning actors Wang Xueqi (Bodyguards and Assassins) and Ge You (To Live). The film was described by Vareiety as "a welcome return to form for Chen Kaige" and by BeyondHollwood.com claim it is "not only Chen Kaige’s best film for over a decade, but is one of the best Chinese blockbusters of the last couple of years." 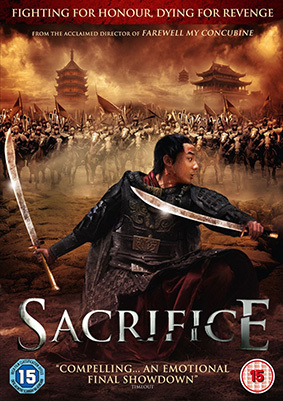 Sacrifice will be released on UK DVD (what, no Blu-ray?) on 27th May 2013 by High Fliers Films at the RRP of £14.99. Extra features? Doesn't look like it.